We've been pretty lucky so far with Little Man and the stuff that's really important to him, One of our first trips with him was to Des Moines and we almost forgot his blue blanket- but a quick call to the hotel bailed us out and we managed to pick it up. There was that time I left his cowboy boots in the seat of one of the race car grocery carts at Hy-Vee and had to frantically drive back to the parking lot- only to amazingly find that the boots were still there and the cart hadn't moved an inch. There was those frantic few hours when Baby Bear was missing, whereabouts unknown until we figured out that Little Man had stashed him in the cupboard under the sink in the bathroom. But, our luck ran out, finally, with his keys. Ever since we moved into the new house, he had been missing those keys. And when I finally found them in a box downstairs and surprised him with them the next morning, he was so happy- like the ridiculous, unadulterated joy that only kids have. He had 'missed his keys so much' and immediately, he wanted to go Tot Time with them. Now, Tot Time had been a semi-regular tradition at the Old Place. We were right across from Mercer Park and it was a cheap and easy way for him to get his yayas out for a few hours and stretch his legs and his imagination a bit. (He conceived of some astonishingly detailed restaurants at Tot Time. Usually called 'Blue Car' or 'Blue Car Restaurant' and serving ice cream, macaroni and cheese, soup. He would make me sit down and cook it up for me too. Occasionally running out to get extra ingredients from Hy-Vee of course.) One of the things he loved to do was ride the cars or the big wheels- and while the big wheels he went bananas on, joining the Easy Rider-ish gang of slightly older kids who would race around the gym like speed demons, whenever he hopped in a car, he would want keys. Usually mine. And I'd let him have mine, but I'd always want to keep a very close eye on them, because being 3 or 4, he could get distracted pretty easily and then he'd leave the keys, my keys- in the 'ignition' and I'd have to rush over and retrieve them before they got lost- or worst, snatched up by another random tot for purposes unknown. Point is, he loved those keys. And he wanted to go to Tot Time with them, so having slept late and missed his Ninja Class (yes, you read that correctly. Just go with it, though) we decided to go to Tot Time. We arrived at about 10:45, were waved in and he went ahead and did his thing. Little Dude and I strolled around in the stroller. Little Man would 'play the policeman game' and pull us over occasionally and then it was all done. He skidded and nearly flipped his big wheel parking it- which is the last time I remember seeing the keys around his neck. Then we left. 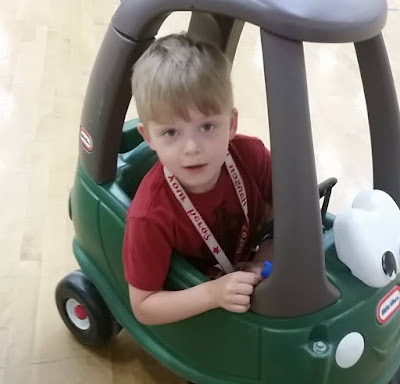 We had to run up to the School District Offices* to drop off one final piece of paperwork for preschool registration and as we were heading back out to the car, I realized that he didn't have the keys around his neck. I got him back in the car and did some discreet checking- since while I had noticed the keys were missing, he hadn't and the last thing I wanted was a sad, freaking out 4 year old. I couldn't find them anywhere in the car so that meant we had to roll the dice and see if someone had turned them in back at Mercer Park. Staff was excellent, checked high and low with no dice. They took my contact information, so there's still some hope- but in the meantime, the keys are gone. So I had a sad 4 year old my hands. And I did my best to explain that sometimes things just get lost, but ever since, maybe once or twice a day, he'll come up to up my, shake his head and ask me in that sad little tone of his "Daddy, where are my keys? I miss my keys?" *If you want a sad look at the state of modern journalism, consider the fact that the local school district now resides where the local newspaper used to. They've moved to a lonely second floor somewhere downtown.